It's a small attempt to post the recipes learnt and tested in my kitchen. Hope u enjoy your stay. Brinjal is my favourite veg and no one eat this veg at home.When ever i am with my mom she makes brinjal curry for me.This recipe i got it from Sanjeev Kapoor's book and the picture tempted me to attempt this curry.The taste is wonderful and goes very well with hot parathas or rotis.Here is the recipe..
1.Wash and cut brinjals into lengthways and keep in water until further use. 2.Wisk yogurt and salt together.Pat dry brinjals on kitchen towel. 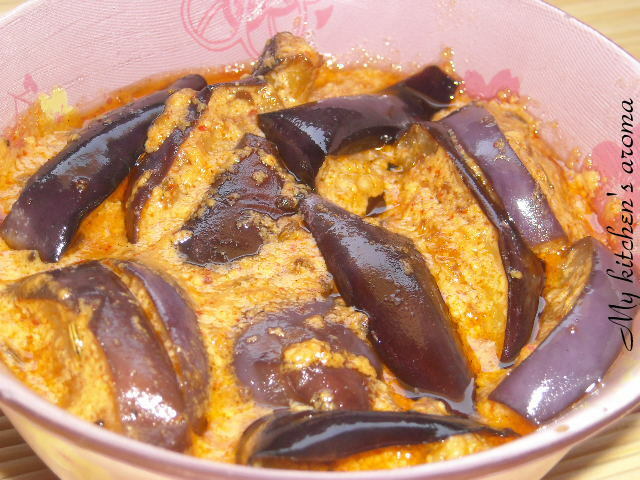 3.Heat oil in a kadai and deep fry brinjals until golden light brown. 4.Heat 2 tbsp and add asafoetida and green cardamoms.Stir fry briefly and immediately add the wisked yogurt. 5.Stir in fennel,dry ginger and red chilli powders. 6.Cook on medium heat for two to three minutes and add fried brinjals. 7.Reduce heat and cook covered for three to four minutes. Serve hot with parathas or roties. Beautiful baingan dish looks prefect rotis..
Dahi baigan looks wonderful and yummy. Mouthwatering, will try this. Looks so creamy and rich. Nice dish and recipe Saritha. Brinjal is my favorite too! In fact, I have a draft like this waiting to be published! It's scrumptious! Looks spicy..would go so well with jeera rice. I wish I could eat eggplant like how it is cooked here... I want to make it just so that I can eat the sauce! 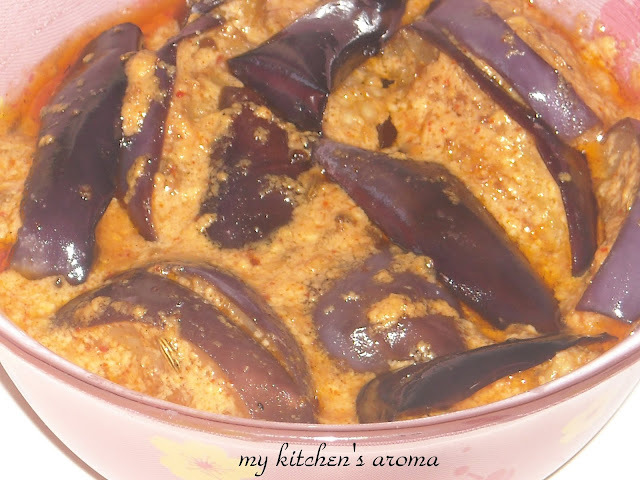 Interesting dahi baingan recipe. Pic is good. I tired this recipe..For u information it didnt come out good.Once you put the curd mixture in the hot pan it splits and starts leaving water.So my idea is fry the brinjals an thn make a taaka with the above ingredients. Reproduction of the contents of this Blog without permission, in whole or in part is prohibited. Powered by Blogger.